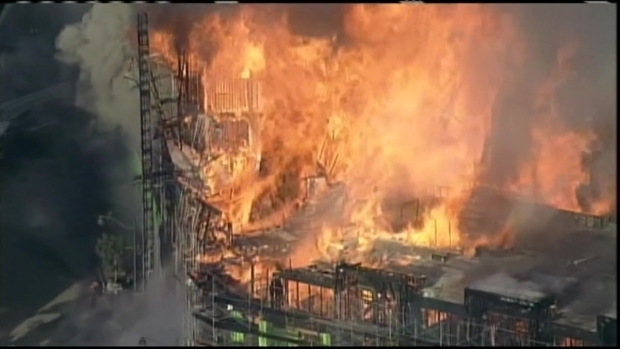 Welding crews doing "torchwork" on a huge apartment complex under construction is the focus of the fire investigation in San Francisco's Mission Bay district, the city's mayor and fire chief said Wednesday. Fire crews were still pouring water on the building Wednesday evening. Construction crews started dismantling the burned out building at 3:45 p.m., with smoke spewing into the air. "It’s such a hazard right now - the building is leaning in several places all down Fourth Street," said Stephen McGuire of the San Francisco Police Department. 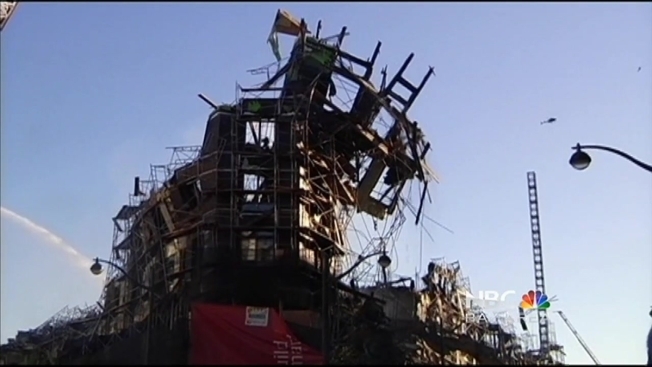 Fire investigators say the massive blaze had the potential to burn down the entire block. Investigators believe the fire started on the eigth or ninth floor of the building. San Francisco police chief Joanne Hayes White and Mayor Ed Lee got a closer look at the gutted building Wednesday morning. Although arson investigators have not yet been able to enter the six-story 172-unit complex on the west side of Fourth Street near the AT&T ballpark, Fire Chief Joanne Hayes-White said at a news conference that preliminary interviews indicate that some "torchwork" had been going on before the workers took off for the day about 3:30 p.m. or 4 p.m. on Tuesday. NBC Bay Area first reported that possibility late Tuesday night. About 45 minutes later - at 4:56 p.m. - the blaze ripped through the would-be $220-million complex owned by San Francisco-based BRE Properties, causing its partial collapse. BRE reportedly expected to sell each unit for $630,000. Suffolk Construction, the contractor working on the building, had "no comment" when contacted by NBC Bay Area on Tuesday evening. The site is on Fourth Street at China Basin Street near AT&T Park where the San Francisco Giants play. On Wednesday, Fourth Street remained closed, as crews worried that the rest of the building and scaffolding might fall to the ground. At its peak, the fire escalated to five alarms and took half the city's firefighters to quell it. Strong early morning winds hampered efforts of San Francisco firefighters on Wednesday to completely stamp out the hot spots. 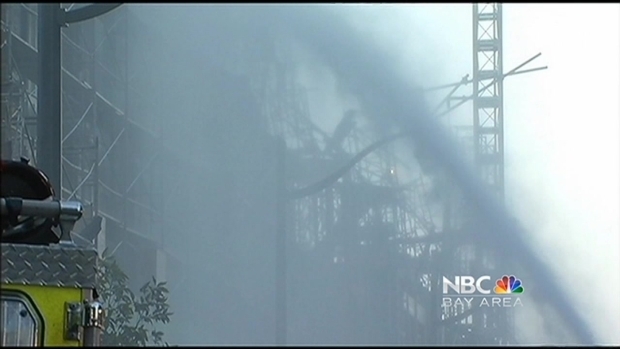 San Francisco Mayor Ed Lee said 30 units across from the fire were still uninhabitable because of smoke damage. And as of Wednesday morning, a building manager told NBC Bay Area that about 350 units in two apartment buildings were still closed off out of an abundance of caution. "This was a horrific fire," Lee said. Deputy Chief Mark Gonzalez added that this was the "biggest volume of fire, just the size of it," in his entire career. Although nobody was seriously injured int he fire, the blaze disrupted the lives of hundreds of people who live in two apartment buildings across the street. One of the apartment complexes still closed off to residents on Wednesday was the 192-unit Strata Apartments at 1201 Fourth Street, where windows shattered and sprinklers were set off because of the radiant heat from the blaze. Across the street, 147 units at Venue Apartments on Fourth Street also were closed. Strata Apartments manager Cynde Thiara said she just didn't feel it was safe for her tenants to go back inside, longer than to check on things for a minute or two, because of the potential of the BRE building to fall down completely. 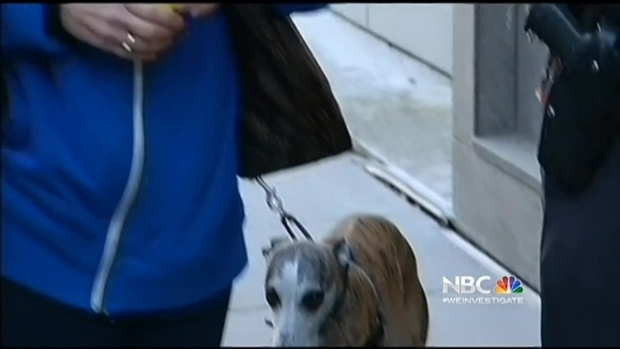 Artie Moffa is one of the more than 300 residents displaced by the fire. Moffa said that the windows on his sixth floor apartment shattered under the intense heat from the fire. The heat also melted his girlfriend's bike on the balcony. "It's been a hell of a day," said Akram Boukai, who lives at the Strata Apartments. "I have a 7-month-old baby. I won't go back in because of the smoke." Moffa and hundreds of others are now staying in hotels or with friends until they are given the "all clear" to come home." "I have two jobs - one here and one in Silicon Valley - I think I’m going to go down there because motels are cheaper down there, if that’s where I need to be tonight," Moffa said. Cindy Streikger went back into her apartment for a few moments, fearing that sprinkler water would have damaged her belongings. When she came out, she was happily surprised. "The hallways are dirty," she said, noting that was all the damage she saw on her western side of the building. No civilian injuries were reported. But of the 150 firefighters battling the blaze, two suffered minor injuries: One suffered minor burns to his face, and another got her ankle twisted in a hose. On Tuesday, San Francisco Fire Department spokeswoman Mindy Talmadge said the fact that building was under construction made battling the blaze more difficult because the building's fire suppression systems had not been completely installed.Workers were in the process of installing sprinklers, but none were working yet, according to public records. 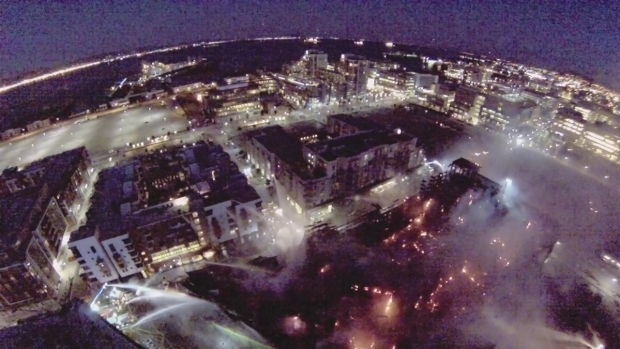 The fire was so big and hot at one point, that embers jumped across the way to the roof of the nearby Smith Cardiovascular Research Center at UCSF. But crews were able to quickly extinguish those flames. Cheryl Hurd, Monte Francis and Riya Bhattacharjee contributed to this report.